A war has been waged along Lions Park’s nearly 2,000 feet of shoreline ever since the park was redeveloped. But no matter how hard the volunteers worked along the Port Washington Narrows, the weeds just kept coming. The city parks department has an “adopt a shoreline” program aimed at giving volunteers their own little slice of coast to maintain. But on Friday, parks officials decided to change up the strategy a bit in what will likely put the weeds into submission for awhile. 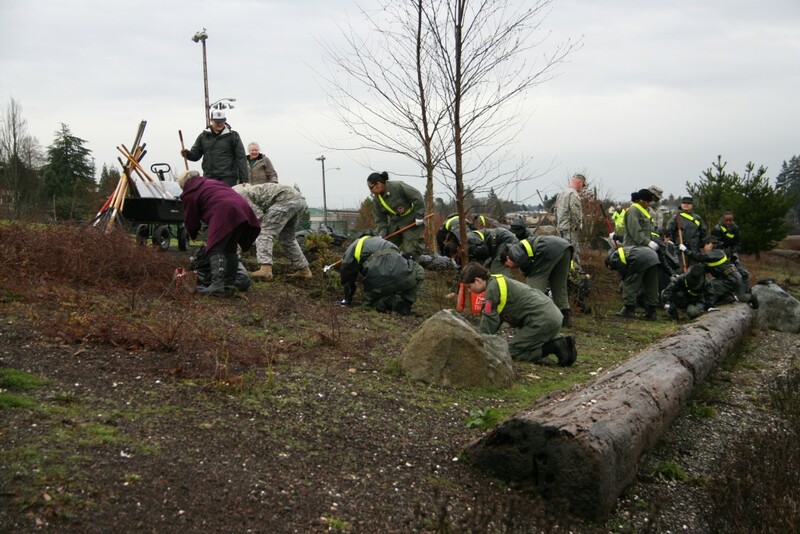 A small army of volunteers, many of them students of the Washington Youth Academy, helped grub the parkland’s edge with Puget Sound before spreading a new coat of beauty bark along the entire coastline. Some new plants went in as well, paid for by some of the salary of the late Mike Sullivan, the former City Councilman who represented the area. The rugged work was not only to build stamina but learn a lesson in community, Youth Academy Master Sgt. Ayesha Willis said.